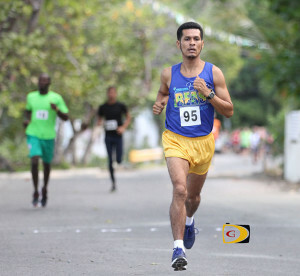 With most regular runners either running as individuals or were on teams tackling the grueling 50km Tortola Torture on Saturday, Ruben Stoby led a small band of runners in the second Dive BVI 10K Series race—on the toughest segment of the course for the upcoming Virgin Gorda Half Marathon. 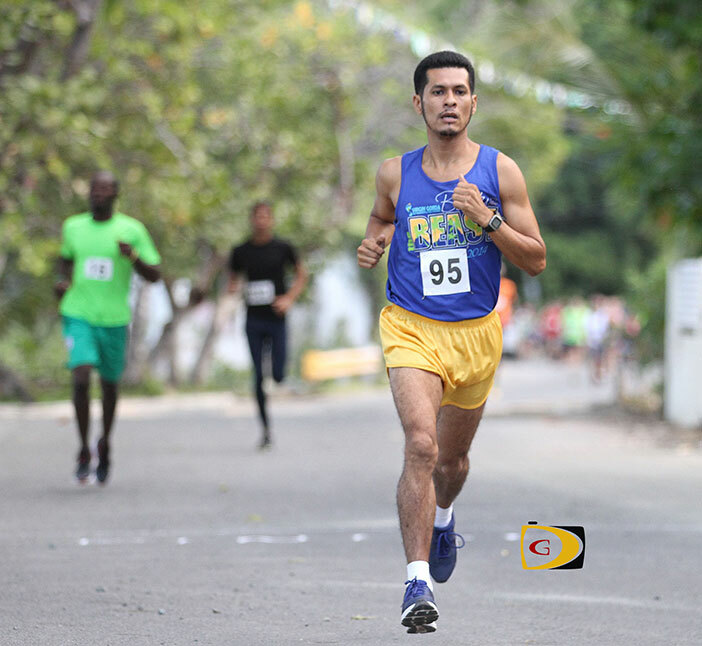 Stoby—undefeated so far this season—led the charge up to Gorda Peak and Nail Bay unchallenged, to win in 42 minutes and 57 seconds, as part of familiarizing himself for a run at the top prize when the event goes off on May 9, for which over 60 persona have already pre registered. The race Stoby said, gave him a better idea of how to plan his run and conserve, as the first half of the race takes in the steepest climbs on Virgin Gorda. “Going is definitely tough and I’ll have to keep something in the legs for the second half, which is nothing compared to the first segment of the course,” he explained. Nadine Leslie was the women’s winner in 56:17. Final results; Men: 1. Reuben Stoby, 42 minutes and 57 seconds. 2. Alan Cundall, 49:51. 3. Ezron Simmons, 53:33. 4. Joseph McIvor, 56:08. 5. Jermain Abrams, 59:23. 6. Scott Butz, 1:13:07. Keith Williams, 1:17:29, Zoltan Birinyi 1:30:30. Women: 1. Nadine Leslie 56:17. 2. Kay Reddy 58:40. 3. Sarah Hayes, 1:00:54. 4. Rhiannon Junes, 1:04:42. 5. Becca Knight, 1:06:24. 6. AJ Syrett, 1:08:41. 7. Eva Askulv, 1:10:20. 8. Tara Murphy, 1:14:19. 9. Chris Yates, 1:38:34.